Nashville, Austin…Hamilton — so goes the ambitions of “Steeltown,” a.k.a. the “armpit of Ontario,” as its colloquially known up in Canada, to land itself in the chain of thought as the next great music tourism destination. Boasting the conception of The Band, when they were known as The Hawks, pre-Dylan collabs, and punkabilly crew Teenage Head, hosting the Juno Awards a half a dozen times, and 30 clubs embracing live music at least twice a week, the town’s City Hall is doubling down on a plan incubated in the fall of 2016 to implement a “music strategy” to essentially make it a global destination for tuneage enthusiasts. In everybody’s favor is already a mass exodus out of Toronto by new creatives to get in on the resurgent artist movement, as a tale as old as gentrification goes. Follow the cheap rent, people. Buzzfeed dabbled in sarcasm about it, even. Though as part of the plan, the ‘music strategy’ think-heads at Hamilton City Hall locked down local artist and musician Dave Kuruc to erect his idea of two nine-meter (30 feet) glass towers, that will feature lyrics from a dozen musicians and bands that are/were Hamilton-based at one point. So far some of the artists range from Robbie Robertson from the aforementioned pre-Dylan Hawks era, to a local folk icon Stan Rogers, the also aforementioned Teenage Head and another punkish crew, The Forgotten Rebels. 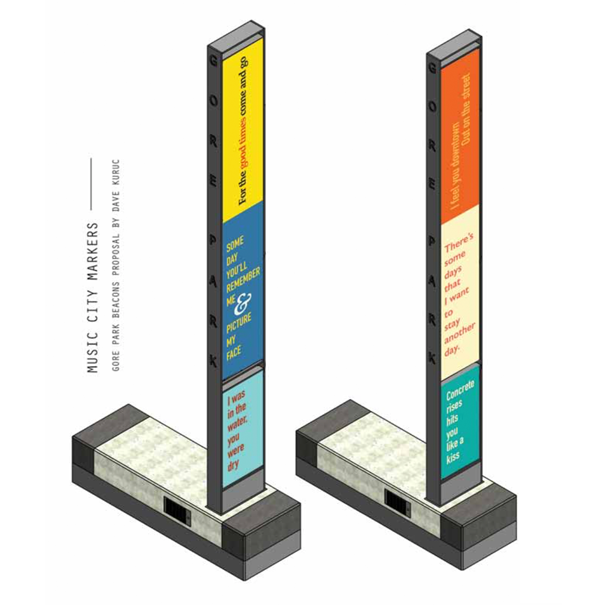 Dubbed “Music City Markers,” the two towers will stand in one of the city’s revered green space, Gore Park. This is pretty rad for several reasons, but chiefly that lyrics usually take a backseat to major city art installations, projects usually reverting to statues or interactive elements like say fellow Canada town, Montreal, and their musical swings. Kuruc is collaborating with local print shops to basically create giant liner notes/concert posters on a city stage. So in other words when’s the next flight to Hamilton Rock City?